Drift_91 added a comment to T134876: Black screen after alt-tabbing out and back into Arma 3 - "UNABLE_TO_INIT_DXGI". @BlackShot could possibly be a Nvidia or Windows 10 problem then I guess. Drift_91 created T137662: Random Crashes. Drift_91 added a comment to T127303: Launcher's server browser fails at receiving more than 15-20 mods. Pretty sure this is a duplicate of T123655. Drift_91 added a comment to T123655: Arma 3 Launcher Server browser unable to display required/optional mods after a certain limit. @BISWizard, is there no way to develop an in-house solution or nag at Valve to fix the issue? I just realized that I never mentioned this but the game doesn't immediately crash. When I tab back in and it gets blocked by another window the game turns to a black screen and needs to be killed with task manager. With the crash dump in my last post I had enough time to reopen the launcher before killing the game with task manager and the launcher still acted like the game had crashed and not been simply closed. @Wulf I'm using fullscreen. Fullscreen-windowed has the flaw of blocking me from accessing the desktop in Windows 10, which I believe is Microsoft's fault and not BI's, otherwise I would be using it. @Wulf It's still occurring, it seems. I've updated my graphics driver and I don't use the steam overlay. 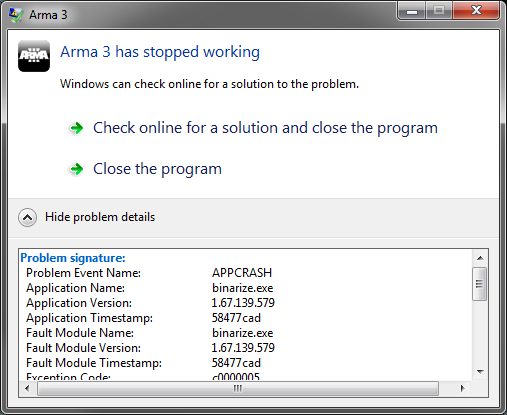 Drift_91 created T135945: Arma 3 Launcher Exception. Drift_91 added a comment to T80719: Animals can open door (snakes too). Drift_91 added a comment to T59444: Snakes can open doors. 7 month is not enough for Bis to block doors from opening by animals. Gratz. Drift_91 created T134877: "Too many virtual memory blocks requested". Drift_91 updated the task description for T134877: "Too many virtual memory blocks requested". Drift_91 created T134876: Black screen after alt-tabbing out and back into Arma 3 - "UNABLE_TO_INIT_DXGI". Drift_91 added a comment to T134635: Random crash. These ones are from "B_CargoNet_01_ammo_F". It happens even when I first start the mission and go right into Zeus, place the box and double click it. Drift_91 created T134635: Random crash. Drift_91 added a comment to T132142: Random CTD while entering Zeus. Unfortunately I don't have that RPT file anymore due to the automatic log rotation. Drift_91 added a comment to T123094: Add API for scripted mouse button and joypad controls. Drift_91 updated subscribers of T123094: Add API for scripted mouse button and joypad controls. @Alwin I take it this isn't going to ever be implemented? Would be quite useful for a lot of mods. CBA managed to find a workaround but there are other mods that aren't able to assign mouse buttons as inputs. Drift_91 created T132142: Random CTD while entering Zeus. Drift_91 created T131548: Arma 3 exited in an unexpected manner. Drift_91 created T127976: Headless client counts as player on dedicated server - Results in many issues/quirks on server. Drift_91 added a comment to T127582: Mines. Drift_91 created T127601: Crash Report. Drift_91 updated subscribers of T127582: Mines. Is anyone from Bis checking this out? Drift_91 added a comment to T124461: Arsenal refuses to load half your loadouts if you have too many of them. Confirmed. I had a quick look into the Arsenal script but couldn't find the reason. Drift_91 added a comment to T122717: Arsenal - Fixed range of loadouts un-loadable - LOAD button greyed out. Drift_91 added a comment to T125033: Planes accelerate on ground with engine on and open dialog/menu. Have also experienced this. Very annoying. The whole point of pausing the game is so I can go AFK or alt-tab without my plane crashing into stuff. If I recall correctly this happens when entering Zeus and possibly the map as well (map might have been fixed already). Drift_91 changed Reproducibility from reproducibility:unable to reproducibility:always on T124461: Arsenal refuses to load half your loadouts if you have too many of them. Drift_91 edited Steps To Reproduce on T124461: Arsenal refuses to load half your loadouts if you have too many of them. Drift_91 changed Reproducibility from reproducibility:always to reproducibility:unable on T124461: Arsenal refuses to load half your loadouts if you have too many of them. Drift_91 changed Reproducibility from reproducibility:nottried to reproducibility:always on T124461: Arsenal refuses to load half your loadouts if you have too many of them. Drift_91 changed Severity from severity:minor to severity:major on T124482: Scripts executed via "Expression" field of Vehicle Respawn module sometimes fail to execute. Drift_91 changed Severity from severity:minor to severity:major on T122770: Headless clients keep mission running on non-persistient dedicated server even after all players disconnect. Drift_91 added a comment to T120212: Binarize.exe crashes when using Addon Builder. Any progress made on this? Drift_91 added a comment to T122770: Headless clients keep mission running on non-persistient dedicated server even after all players disconnect. I filed this ticket 7 months ago and it seems like no one at BI has even tried to reproduce it. Here's my Arma 3 profile vars file which I believe contains my saved loadouts, in case it's caused by something more complex and you need it to reproduce the issue. Drift_91 created T124482: Scripts executed via "Expression" field of Vehicle Respawn module sometimes fail to execute. Drift_91 created T124461: Arsenal refuses to load half your loadouts if you have too many of them. I've edited the title of this thread to better describe the issue. Drift_91 renamed T120212: Binarize.exe crashes when using Addon Builder from Addon Builder Issues with Binarizing to Binarize.exe crashes when using Addon Builder. Having the problem yet again, this time with a different mod. Building the mod without binarization works fine. I don't see why this still isn't fixed. Drift_91 changed Severity from severity:major to severity:minor on T122770: Headless clients keep mission running on non-persistient dedicated server even after all players disconnect. Drift_91 changed Severity from severity:block to severity:major on T122770: Headless clients keep mission running on non-persistient dedicated server even after all players disconnect. Drift_91 created T123094: Add API for scripted mouse button and joypad controls. Drift_91 created T122770: Headless clients keep mission running on non-persistient dedicated server even after all players disconnect. Drift_91 added a comment to T80631: Multiplayer: Client crash after download of mission, while loading mission. Just discovered that it might happen persistently when joining the server after the mission has started, but not when JIP'ing the mission if already connected to the server. So I apologize if this is in the wrong thread. I just started experiencing this today on Dev branch with the 64-bit build on my server and huge pages enabled. Been experiencing it on two separate mission files I made myself. It seems to only happen to me when the mission has already started (JIP). It doesn't always happen but once it does it will happen consistently until the mission ends. A friend and I have also been getting occasional crashes mid-game as well. Drift_91 added a comment to T67766: Multiple Admins on a Server. This is really annoying, as I want my buddy to be able to type inits into objects VIA zeus when I'm not around. If I give him the admin password then I can't do anything myself when he's already logged in. Hello, can you share the parameters you're using in Addon Builder? Drift_91 created T120212: Binarize.exe crashes when using Addon Builder. Drift_91 added a comment to T79845: Portable Helipad Lights - IR & Non-Strobe Option. Come on Bohemia, it's been two years... Would this not be a quick change of a few lines of code to the asset? 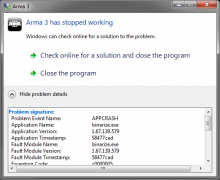 Drift_91 added a comment to T82371: When I start arma through arma 3 Sync its not starting battleye service. Drift_91 added a comment to T61655: Add ability to run multiple game instances for testing purposes. I think this should be marked as solved. Steam now opens the launcher instead, which can be used to launch multiple instances (only with the same mods selected though). You can also launch the game directly from the executable multiple times without any interference from steam as far as I know. The only problem I have is launching the game from steam while my dedicated server is running. Going to make a separate report about that one though since this is so old and not 100% relevant.